In our talk of teaching, we often focus quite narrowly on classroom-based teaching – team-based learning (our SGL) and lecturing – and on clerkship seminars and bedside teaching. By doing so, we can overlook some of the other roles required in medical education. In fact, there are 12 roles of teachers in medical education and each is worth exploring. Harden and Crosby (2000) identified these 12 roles based on their analysis of “the tasks expected of the teacher in the design and implementation of a curriculum in one medical school”; a study of “diaries kept by 12 medical students over a three-month period”, which analyzed their comments on teacher roles; and from other literature on the roles of teachers in medical education (p. 336). They then validated the 12 roles they identified using a questionnaire completed by 251 teachers at the University of Dundee Medical School. Harden and Crosby grouped their 12 roles into six areas of activity (two roles each) and further noted which roles required medical expertise and which teaching expertise and which involved direct student contact, with the remaining with students at a distance to the activity. How many of these areas of activity and roles do you recognize in your own teaching practice? “Monitoring and evaluating the effectiveness of the teaching of courses and curricula is now recognized as an integral part of the educational process. The quality of the teaching and learning process needs to be assessed through student feedback, peer evaluation and assessment of the product of the educational program.” (p. 340). For Harden and Crosby, curriculum planning and organizing courses goes hand-in-hand. The note that “Curriculum planning presents a significant challenge for the teacher and both time and expertise are required if the job is to be undertaken properly” (p. 341) while being an essential first step. This is closely followed by the importance of planning on the individual course level: “The best curriculum in the world will be ineffective if the courses that comprise it have little or no relationship to the curriculum that is in place. Once the principles that underpin the curriculum of the institution have been agreed, detailed planning is then required at the level of the individual course.” (p. 341). The increasing importance of the role of resource material creator helps students navigate in increased amount and quality of information available. “With problem-based learning and other student-centred approaches, students are dependent on having appropriate resource material available for use either as individuals or in groups.” (p. 341). The role of curator, through structured study guides, also helps navigate these resources: “Study guides…can be seen as the students’ personal tutor available 24 hours a day and designed to assist the students with their learning. (p. 341). At different times, you may be called upon to fill any or all of these roles. If you’re interested in exploring any of them further, get in touch. I’m here to help you with all aspects of your teaching practice. In a pedagogical quest for active learning, we’ve somehow cast lectures in the role of arch-villain. This is definitely the case of a pendulum swinging too far. 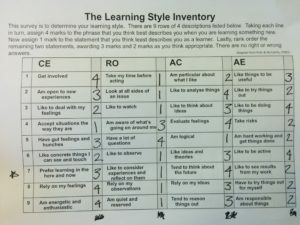 While research definitely supports active learning as the optimal way for students to retain learning – applying new knowledge either to simulated or real scenarios – the initial learning has to come from somewhere, and lectures are one of these sources. Because of our focus on improving small group learning/TBL sessions in our curriculum, I can seem to be anti-lecture. The truth is, I’m actually a closet lecture aficionado. I own DVDs and CDs from The Teaching Company’s “Great Courses” series and love CBC’s Ideas. And the proliferation of podcasts has fed my love of lectures even more, as podcasts are nothing if not fabulous lectures. And TED Talks, who hasn’t lost a few minutes to those? Really, the world loves a good lecture. 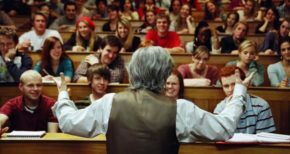 Lectures absolutely have a place in universities in general and in medical education specifically. While we can’t – and don’t want to – return to a curriculum with 100% (or near to it) lectures, we can keep great lectures in our menu of methodologies to provide students with optimal learning experiences. Why do you want to do a lecture? It’s ok if it’s just your first instinct, but think beyond that. Is this the best way to convey your content? How will providing this content in a lecture format enhance students’ learning? 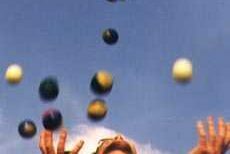 Are you comfortable with the mechanics? Lecturing is a skill which improves with practice. There are certainly standard “do’s” and don’ts”. For example, Don’t read your own slides; don’t keep your nose down in notes. And the classic: Don’t be boring. If you aren’t comfortable, do you have a plan to improve? How can you keep things fresh and interesting for an hour or more? Research on attention habits tell us that after 20 minutes of sustained listening, it’s hard to stay focused. With this in mind, how can you pace you lecture to break things up? Consider things like polls (with our PollEverywhere account), short think-pair-share activities, or other creative ideas. At least one instructor I know shows short topic-related videos and has the class stand up to watch them to get everyone out of their standard sitting positions. If you think of lectures as content delivery, what’s your plan for students to be able to apply this new knowledge? Does your lecture lead into an application session in your own course or in another one? If you’re not the instructor for the follow-up session, be sure to coordinate with the person who is. As with all your teaching endeavours, you’re not on your own. Get in touch – I’m here to help! How does a nurse, working in public hospitals and nursing homes, manage to murder frail, elderly patients without detection? How does it go on for 20 years, resulting in the deaths of eight patients under her care? Why did it only come to attention and stop when the perpetrator herself confessed openly to the crimes? These questions are the focus of an inquest commissioned to investigate the actions of Elizabeth Wettlaufer, a former nurse now serving a life sentence for the crimes to which she has confessed. professional association, the firing was noted officially as a voluntary resignation. 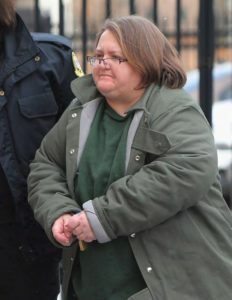 Between 2007 and 2014, while working at the Caressant Care centre in Woodstock, Ms. Wettlaufer was reprimanded no fewer than nine times for medical errors and general incompetence, refused recommendations to take leaves of absence and ignored threats from her colleagues that her increasingly suspicious behaviour would be reported to her licensing body. She was finally fired in 2014. That firing was again officially noted as a voluntary resignation after her union intervened. As a result of that settlement, Ms. Wettlaufer actually received $2,000 and a letter of recommendation. Between 2007 and 2014, while all these concerns were under review, she continued to kill residents of the Caressant Care centre by administering lethal doses of Insulin. On two occasions, the coroner’s office was notified about deaths at chronic care facilities where Ms. Wettlaufer worked. No autopsies or investigations were ordered. If Ms. Wettlaufer had not voluntarily confessed her crimes, they might never have come to attention. She has recently spoken out about loose regulatory processes governing the use of Insulin which made it possible for her to administer overdoses without detection. This is, regrettably, not the first instance of a health care provider using a position of trust to facilitate murder. 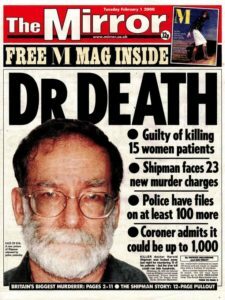 Harold Frederick Shipman was an English physician, considered one of the most prolific serial killers of all time. In January of 2000 he was found guilty of killing 15 patients under his care and sentenced to life imprisonment, but a subsequent inquiry linked him to over 250 murders over his thirty year career. It seems that, in retrospect, numerous warnings of misbehaviour were ignored, including the fact that one of his first victims, an elderly lady previously in good health who was found dead only a few hours after a visit from Dr. Shipman, had recently changed her will to bequeath her entire fortune to him. In fact, most of his patients were in good health prior to visits with him during which injections were administered. It appears that at least three of the murders were directly witnessed by other personnel but nonetheless went unreported. Joseph Michael Swango is an American who is currently serving three consecutive life sentences imposed in the year 2000 for the murder of patients who were under his care while he was practicing as a physician. It now appears he was responsible for as many as 60 fatal poisonings of both patients and colleagues. In retrospect, it is clear that there were signs of very troubling behaviour during medical school. Although considered intellectually brilliant, he exhibited a fascination with dying patients, to the extent of preferring to work as an ambulance attendant rather than going to his classes. It was found at one point that he had submitted falsified documents regarding completion of required tasks. Numerous fellow students and faculty raised concerns about his behaviour and honesty. He was nearly expelled but was allowed to stay on because one member of a review panel felt he should be given a chance to remediate. He was allowed to graduate one year after his entering class and, despite a very poor evaluation in his dean’s letter, secured a surgical internship. While on clinical rotations, nurses had reported multiple instances of apparently healthy patients dying mysteriously while he was on duty. On one occasion, he was caught injecting a substance into a patient who subsequently became very ill. Despite these warnings, no major sanction was imposed, although the program revoked its residency offer. He went on to work as a paramedic and laboratory technician. By changing his name and falsifying documents he was able to get into a variety of different residency programs at medical schools across the United States, and therefore work as a physician, all the time murdering both patients and co-workers, usually with injections of arsenic. The American Medical Association eventually did a thorough background check on one of his applications and uncovered the pattern of previous incidents. 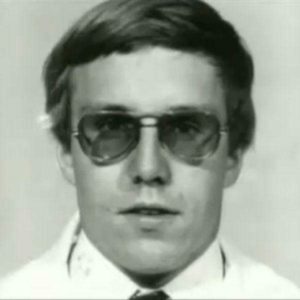 As a result, all 125 American medical schools and over 1,000 teaching hospitals were alerted to his identity and record. Effectively blacklisted from further residencies, he fled to Africa where he secured positions and continued to commit murder. A very complex and thorough investigation eventually led to his extradition, indictment and conviction. These are, mercifully, very rare and extreme examples. However, they remind us that the intelligent sociopathic personality may find the medical or nursing professions ideal environments to prey on the innocent and satisfy the craving to kill. They also remind us that the patterns of deviant behaviour start early and without major impact until fully empowered. Set amongst trusting patients and innocent, often naive colleagues who would have difficulty even conceiving such behaviour, these monstrous individuals are like wolves among sheep. They may also benefit from the well-meaning protection of colleagues and supervising faculty whose first instinct will always be to help and cure rather than condemn. As in the case of Ms. Wettlaufer, they may also benefit from professional organizations and legal processes that put the interest of the individual above potential impact on current and future victims. Unless counterbalanced by administrations and leadership willing to undertake legal challenges and defend the broader interests of the public, profession, and future patients, these behaviours can go unchecked. The upcoming inquest report will surely identify several points at which our processes failed to act and put an end Ms. Wettlaufer’s serial murders. However, there are lessons here for us all who are involved in medical education. The degrees and qualifications we bestow convey an assurance to licensing bodies, institutions and the public that the individuals who hold them are not only knowledgeable and technically qualified, but also trustworthy. We must be vigilant with respect all those considerations, and be prepared to defend the integrity of our educational and evaluative processes. Our responsibilities extend beyond the individual learner, to the public and to potential future patients. We must never set wolves among the sheep.